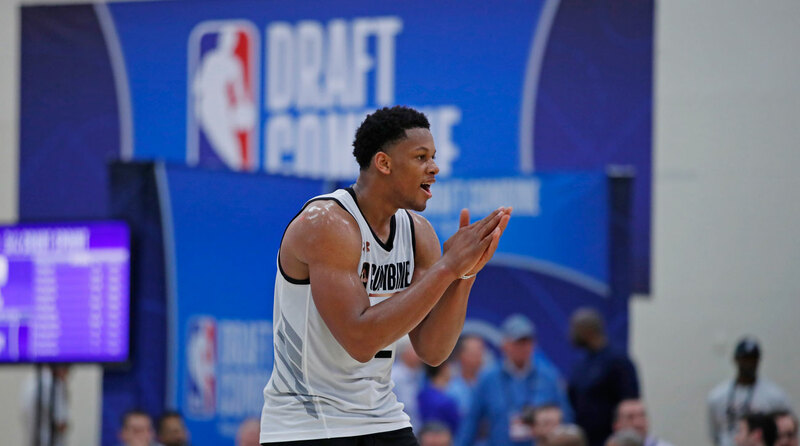 With the early entry withdrawal deadline looming, former agent Matt Babcock breaks down the business components prospects face if they remain in the NBA draft. The Crossover presents a series of entries from former player agent, Matt Babcock. Over the remaining weeks leading up to the 2018 NBA Draft, he will provide a unique look behind the scenes of the draft process—offering a glimpse at how agents advise their players and maneuver the pre-draft landscape. Babcock’s third post details how players should approach the early entry eligibility deadline. The NBA draft's early entry eligibility deadline is approaching and early entrants who have not signed with an agent are still eligible to return to school if they withdraw their name from the NBA draft by May 30. So what are some things prospects should consider before making their decisions? As a former agent, I would like to break down some of the NBA draft components from a business standpoint. These elements should be highly considered by players before deciding to remain in the draft or returning to school. First, and probably most important, since 1995 the NBA has had a system set in place for first-round picks to receive four-year contracts, the first two years of which are guaranteed. The salaries are set on a sliding scale. The higher the pick, the higher the salary. For example, in this year’s draft the No. 1 pick will be slotted to earn $6,746,400 in his rookie year and $7,901,100 in his second year. The last pick of the first round will earn $1,338,900 and $1,568,000, respectively, in his first two years. Conversely, contracts are fully negotiable for second-round draft picks. The players are only entitled to the required tender offer, which is a non-guaranteed minimum contract, in which case salaries are paid on a pro-rata basis. That means a player drafted in the second round can be cut by a team at any time and without being paid any additional money. I hope that the risk of this scenario is obvious. There is definitely a high amount of risk for any second-round draft pick, however, as with any fully negotiable contract, there can be upside. For example, in the 2015 NBA draft I represented Jordan Mickey from LSU. Jordan, an early entrant that year, had a terrific showing at the NBA Draft Combine and did very well in his team visits leading up to the draft. Collectively, we were able to elevate his draft stock to a viable option as a first-round pick. The Boston Celtics had the 16th, 28th, 33rd and 45th picks that year. Terry Rozier was selected with the 16th pick, R.J. Hunter was selected with the 28th pick, and Jordan was selected with the 33rd pick. This meant that his contract would have to be fully negotiated because he was a second-round selection. This negotiation would have to be done with none other than veteran NBA executive Danny Ainge. Long story short, we were able to secure Jordan the largest deal for a second-round pick in NBA history at that point in time. This contract paid him more guaranteed money than many of the first-round picks that year. Another factor to consider when analyzing the second round of the draft are the agendas of each team. Every team’s salary-cap situation is different each season. One team might be well under the projected salary cap with many roster spots available for the upcoming season. This team would most likely select a player they intend to have on their roster the upcoming season, and usually with a decent amount of guaranteed money. On the other hand, a team that is not under the salary cap and/or has limited roster spots available may elect to draft a player and stash him overseas. The “draft-and stash” technique is when a team will draft a player and have him sign a contract overseas for the following season. This allows the NBA team to retain that player’s draft rights to possibly sign as a free agent in future years. These rights are also tradable, often times making these rights hot commodities for teams. Generally, players and their agents will verbally agree to this hypothetical “draft-and-stash” scenario prior to the draft with interested teams. As an example, Jonah Bolden was selected 36th overall by the Philadelphia 76ers in the 2017 NBA Draft. He played this past year in Israel with MaccabiTel Aviv. It is rumored that he is likely to join the 76ers this next season. If a player and his agent decide they do not want to entertain overseas options it could result in the player slipping in the draft. Signing a two-way contract with an NBA team. Signing an affiliate player contract with an NBA team. Signing a contract with a team overseas. Two-way contracts and affiliate player contracts are both very team-friendly, with little guaranteed money for the player. Both deals will have the player spending the bulk of the season, if not the entire season, in the G-League. Typically the most conservative option, from a short-term financial standpoint, would be for a player to pursue opportunities overseas as guaranteed contracts are more common. In this year’s draft, 17 players who were invited to the combine still have to make a decision to remain in the draft or go back to school. This list includes: Udoka Azubuike,Tyus Battle, Brian Bowen, Donte DiVincenzo, Carsen Edwards, Bruno Fernando, Jaylen Hands, Kevin Huerter, Sagaba Konate, Caleb Martin, Cody Martin, Jontay Porter, Omari Spellman, Jarred Vanderbilt, P.J. Washington, Austin Wiley and Kris Wilkes. DiVincenzo and Huerter both arrived at the combine with the projection of being borderline first-round picks. DiVincenzo displayed his unique combination of athleticism, toughness, shooting ability, and overall cerebralness just as he did in the NCAA tournament earlier this year. Huerter measured well at a prototypical height for a shooting guard (6’7”), shot the ball extremely well, and showed an overall offensive versatility that should translate to the NBA seamlessly. Both of these players might have established their worthiness as first-round picks. They face similar decisions: Stay in the draft to cash in on probable guaranteed money, or return to their respective schools? If they go back to school they will be among the hottest names for next year’s draft, a class that is not considered to be nearly as good. Two players in a slightly different situation are Udoka Azubuike and Austin Wiley. They are both “big-bodied” post players, seemingly a dying breed in modern-day basketball. Although they both did well at the combine, they are projected second-round picks, which inherently comes with a substantial amount of risk. These players all have tough decisions ahead of them and there is not always a right or wrong choice. As an experienced former agent, my best advice for these players is to recognize the downside and not only focus on the tempting upside.